Note: RIP A&M It caught fire and was demolished. This may or may not be a public service. 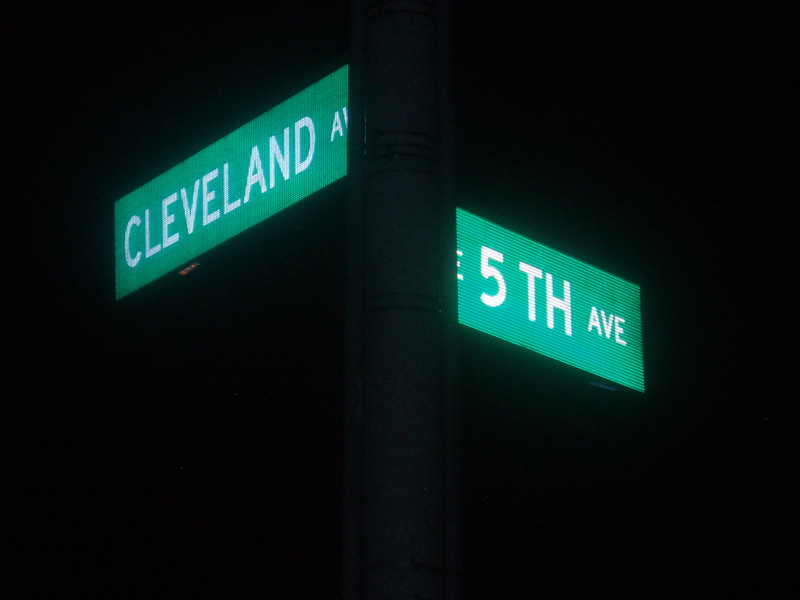 The intersection of 5th Avenue and Cleveland Avenue is a byway for many people and parts of our community. This is on the border of downtown and the Short North and serves as a gateway to the Northside, Linden and elsewhere. State Route 3 passes through and Interstate 71 is nearby. No one lives at this corner, everyone is just passing by on the way to something else. However, something unexpected and unexplained is happening at this intersection. There are FIVE chicken restaurants at an intersection where most smart folk would say even one restaurant would struggle to get by. Church’s Chicken is at the NE corner. KFC is about 200 yards to the east. Popeye’s is at the SE corner. About 300 yards to the west at 4th and 5th, in a building that looks like a bunker is Woody and Jo’s. 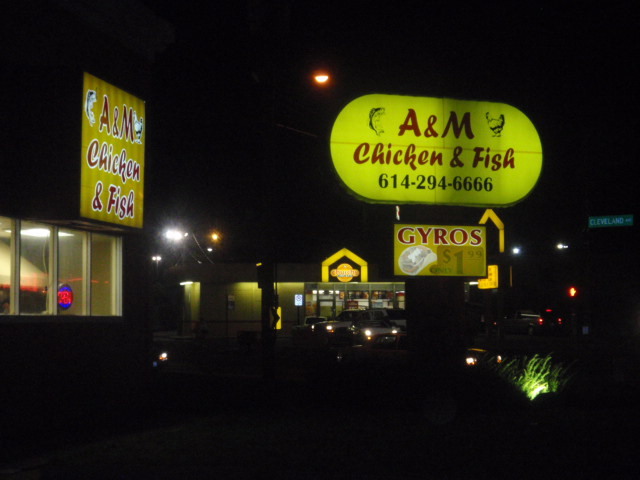 The last member of this poultry quintet is A & M Chicken & Fish. This independent restaurant seems to be the new kid or chick on the block. I can not tell what former fast food purveyor occupied the current A & M space. I parked in the lot of A & M late one night and watched hordes of cars going to all of these chicken places. I saw one or two cars visit two or more spots. This was amazing to watch. Other than A & M, the other corner players are known entities so I will not write about them. 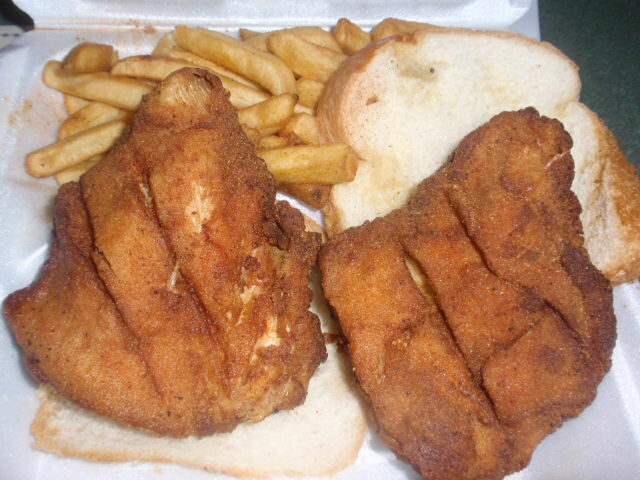 All of the places serve chicken in one style or another. A & M serves chicken from the genus of fried as well. They also serve chicken livers and gizzards and forty varieties of combination meals that take up two page sides to explain. In the arena of fish, these guys are the winner of the corner serving and frying: catfish, white bass, Tilapia, perch, Whiting, Boston Blue, Shrimp, Jumbo Shrimp, Catfish Nuggets. Yes, you read correctly, Catfish Nuggets. Gyro’s and some other comfort foods appear on the menu to boot. My guess is that the owners hail from the Middle East at least based on the crew on duty that served me. A & M has the latest hours (consistently) of the corner (only beaten by Woody and Jo’s on Saturday late, late nights). The staff seemed a bit startled to see me at the window. I guess they don’t see many Subaru driving fooders popping in for late night snacks. They were very nice. They made sure to give me a menu and asked that I call ahead next time so I would not have to wait so long for my food. A & M does cook to order so when you place your order at the drive in microphone you can hear the plunk into the frying oil in the background. I was impressed by the care put into packing my order. The chicken was placed in a styrofoam box and then the box was slid into a thick paper wrapper to preserve heat. I was also given a large quantity of ketchup, hot sauce and tartar sauce packets. A side dish side note, the coleslaw was as good as KFC which is my benchmark for satisfying slaw. Church’s probably has the best fried chicken on the Chicken Corner, Popeye’s seems to have the longest line and A & M appears to have the loyalty of the late night crowd. (Note: No Gourmands were killed in the production of this post, however, while I was out taking photographs I was given the stink eye by some tough looking fellas at the bus stop. When I explained what I was doing they laughed. That made me glad. I was also glad I did not wet my pants when the five of them started walking towards me). Chicken Corner is still clucking along. Church’s, Popeyes and KFC are still doing a good business and holding their corners down. A few blocks west, Woody & Jo’s is having a renaissance of sorts with earlier hours. 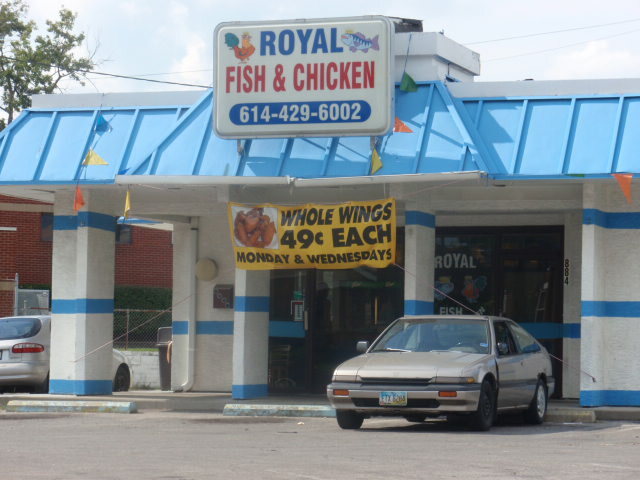 A few blocks to the east of Chicken Corner is Royal Chicken and Fish. I have never been because each time I have dropped by I have been threatened by someone inside while taking a photo, so I’m not going back. First impressions do matter, especially on Chicken Corner.